Mixtechs Recordings’ label boss Theo Tzu will be playing at the Cedar Lounge in The Grove this year. Theo Tzu is no stranger to the Canadian bass music scene, having produced and DJed for over 15 years, as well as having worked as an event promoter in Winnipeg, Manitoba. Theo has also been a stage manager at The Grove (previously called the Labyrinth) every year since 2012. You may have heard him on the radio, as he is a monthly host on Sub FM. He’s made an appearance on Greezy Records, Monkey Dub Recordings, In Da Jungle Recordings, Phantohm Soundsystem, Cerkuz Familia, Balanced Records, Crystal Fresh Music, Head Cornerstone Records and Sub FM and has directly opened for 12th Planet, Joe Nice, Perkulat0r, Bro Safari, Krafty Kuts, Ill-Esha, DJ Craze, DJ Nu-Mark, Mat The Alien, Ed Solo, and Marcus Visionary. Crank the volume with this dubwise, bass heavy, halftime selection featuring tracks from Of The Trees, CharlesTheFirst, Goopsteppa, Thelem, ALXZNDR, DJ Madd & Ahee. The mix also features a previously unreleased track “Konshens – Gun Shot A Fire (Grand Dub Audio Remix)” forthcoming on Monkey Dub Recordings. Enjoy ‘lovelies! 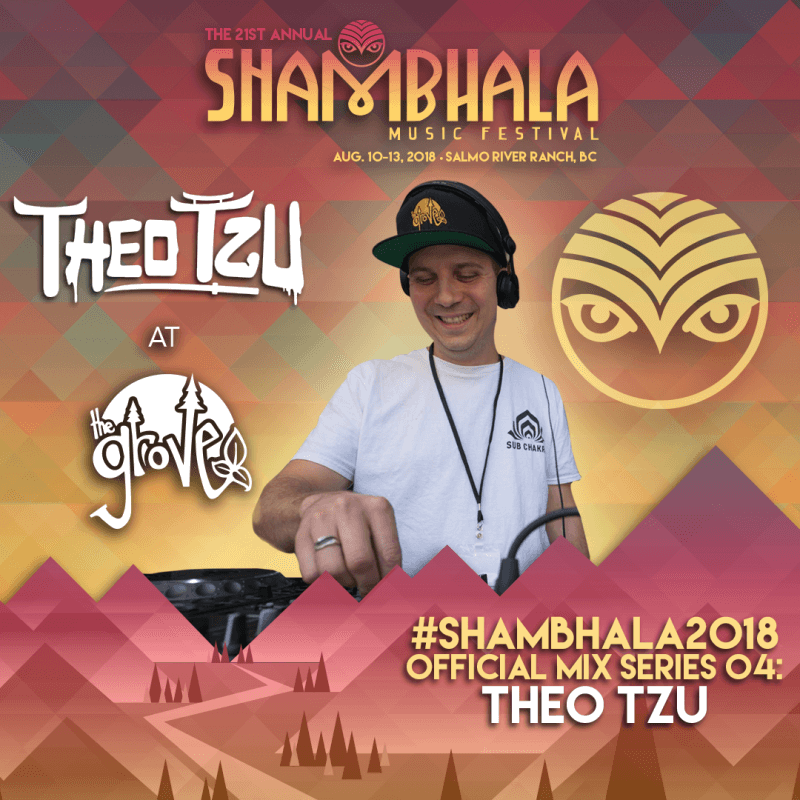 What have you heard about Shambhala Music Festival? For a lot of people, it is home. Everyone waits all year just to come home to the Salmo River Ranch. For many, it is their highlight of the season. Are you ready to camp in the BC Wilderness? I’ve been ready since the first time I visited the farm in 2011. It’s important to stay warm at night, which means bringing attire for winter or hot summer. What will your Shambhala Spirit Animal be? Hawk, for allowing me to play after him last year to a packed Grove when the fires were raging and the rain came to save the day.